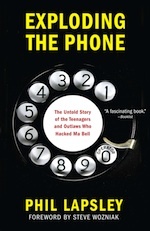 Delighted to report that Exploding The Phone has been selected as a Best Book of 2013 by Gizmodo, the Seattle Times, School Library Journal (! ), and Kirkus Reviews ... all in addition to being on Amazon's best-of list as well. A very nice way to finish up the year. Thanks to everyone who helped! During my interviews with Bill Caming I often used the term Greenstar in our discussions. Ever the AT&T attorney, he would periodically correct me: "No, that's not its name. That was an internal code name that we stopped using." Sometime later I visited the AT&T Archives in Warren, New Jersey, which maintains a computerized index of old Bell System files. I typed in "Greenstar" and watched the display light up like a Christmas tree as it found relevant documents. When I mentioned this to Caming a few days later, he gave a rueful laugh and responded, "Well, I guess you can't keep a good name down." I am delighted to report that Exploding The Phone has been selected as one of Amazon's best nonfiction books of 2013! (In the top 10, in fact.) Many thanks to everyone who has supported me in this crazy project! I will try to dig out some other gems from the Sourcers and Notes chapter and post them here. In Exploding The Phone I wrote about pioneer phone phreak David Condon who modified a Davy Crockett Cat and Canary Bird Call Flute to generate the 1,000 Hz tone -- modulated by a 20 Hz warble -- that was used as the "ring forward" signal on certain long-distance circuits back in the 1950s. In the very best creative naming traditions of the Bell System it was called the "1A Whistle" and it generated the same "thousand by twenty" ring forward tone. It was used by technicians in the field to send a ringing signal to terminating offices. Thanks to the Yahoo "coldwarcomms" group member Ozob for bringing this to my attention and to Paul Wills of the telephonecollectors.org web site for posting the photo and audio files. Terence Eden has a nice blog post about 3D-printing a 2,600 Hz whistle, just for fun. No, it's not actualy a Cap'n Crunch whistle, but it does hit the right note. In researching Exploding The Phone I spammed various federal agencies with hundreds of Freedom of Information Act (FOIA) requests. The FBI bore the brunt of my requests since I figured they were the agency that had the most info on phone phreaks. According to my tracking spreadsheet I sent them about 400 requests over the course of four or five years. Recently Jason Smathers of Muckrock filed his own FOIA request to the FBI, asking them for a copy of their "vexsome filer list" (vexsome: adj., tending to cause annoyance, frustration, or worry ). You can see the details on his request and the FBI's response over on Muckrock's web site. Although I'm thinking it should probably technically be "vexatious", not "vexsome." "Many telephone services have been curtailed because of so-called hackers, according to Professor Carleton Tucker, administrator of the Institute telephone system. [...] The students have accomplished such things as tying up all the tie-lines between Harvard and MIT, or making long-distance calls by charging them to a local radar installation. One method involved connecting the PDP-1 computer to the phone system to search the lines until a dial tone, indicating an outside line, was found." In addition to being an interesting bit of phone phreak history, this is the first published use of the word "hacker" (used in its modern sense) that I'm aware of. As a side note, Prof. Tucker was famous for overseeing MIT's phone system. He was also instrumental in getting Amos E. Joel, Jr. a job with Bell Labs -- Joel later went on to become the head of switching at the labs. P.S.. Management apologizes for the hiatus in Document of the Week postings... certain small matters, such as moving back to the U.S., intruded. We hope to be back on a more regular, if not weekly, posting schedule forthwith. In honor of the PRISM media frenzy, this week's Document of the Week concerns Greenstar, the AT&T toll fraud surveillance system that randomly monitored some 33 million American phone calls -- and recorded 1.5 million of them -- between 1964 and 1970. As I write in Exploding The Phone, "A single Greenstar unit would be connected to a hundred outgoing long-distance trunk lines and could simultaneously monitor five of them for fraud. [...] At its core, Greenstar looked for the presence of 2,600 Hz on a trunk line when it shouldn't be there. [...] When Greenstar detected something unusual, it took an audacious next step: it recorded the telephone call. With no warrant and with no warning to the people on the line, suspicious calls were silently preserved on spinning multitrack real-to-reel magnetic tapes." (p. 93). In fact, when I interviewed Lou Rose in 2006 he told me that he had an actual Greenstar mag tape in storage someplace! He had gotten it from the source who leaked the Greenstar information to him in the first place. Unfortunately, when we talked, he was away from home and wasn't able to dig around and root it up for me. A pity, since that would have made a nice little bit of telephne memorabilia. Copyright © 2005-2008. All rights reserved. Thanks to flickr user snowmentality for the image used in our logo!